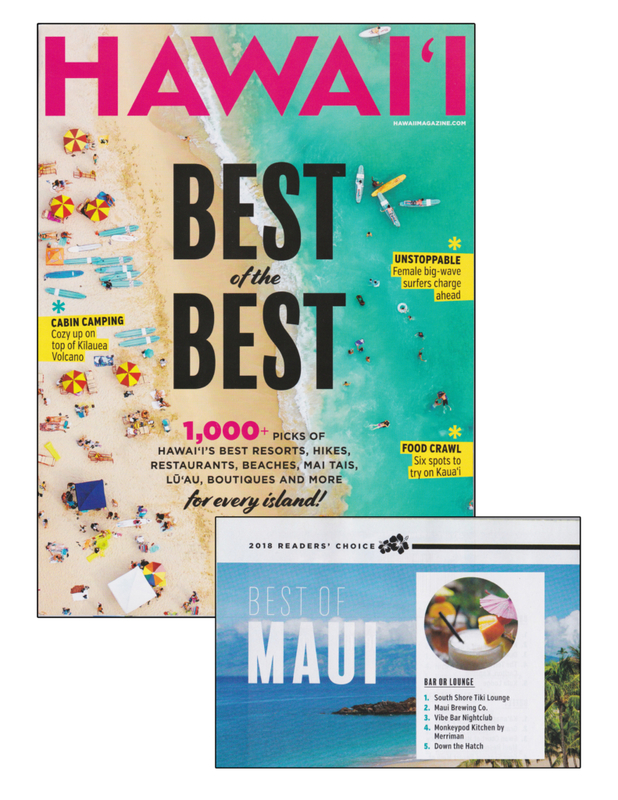 South Shore Tiki Lounge voted Best Bar on the island of Maui by Hawaii Magazine readers. South Shore Tiki Lounge named one of the 10 Best Bars in Maui. PBS named South Shore Tiki Lounge best pizza in Maui. South Shore Tiki Lounge wins BEST BAR again. Josh wins Best Bartender and Renee wins Best Server runner up. South Shore Tiki Lounge wins BEST BAR! Grace wins Best Bartendress and Renee wins Best Server. Even our hotdog got a nod as a runner up for best local hot dog. That’s Amore – These pizza places will sweep you off your feet. In Worst of Times, Bar Owners Find Success by Sophie Cocke ” For complete story, click here. Voted BEST LOCAL PIZZA and BEST PLACE TO DANCE. Sarah Stern is 2x reigning Best Female Bartender. Runner up nods for Jake Morris, Best Male Bartender and Charissa Hernandez, Best Female Server. For more click here. “A host of new menu items are tempting diners at South Shore Tiki Lounge in Kihei. ..” Click here for the story. “Awesome pizza… arguably the focal point to Kihei’s famed Barmuda Triangle.” Click here for the story. Voted BEST BAR for the fourth straight year. Sarah Stern wins Best Female Bartender. Runner up nods for Jake Morris, Best Male Bartender and Best Place to Dance. Art & Culture on Maui May/June 2009 issue published an article entitled “Reinvisioning Tiki.” Covering the history of the Tiki subculture, the piece also touched on the South Shore Tiki Lounge and the new artwork that adorns its walls. Pick up a copy of Art & Culture on Maui or click here to view in their schnazzy online page flipper. The article starts on page 14. South Shore Tiki Lounge awarded silver ‘Aipono Award for Best Bar. Voted Best Kama’aina Deal in South Maui by readers of Maui Weekly! This is a choice spot for those desiring a little sunshine while reversing the symptoms of zombieism. The bloody Mary here is certainly incongruous with this place’s retro-tropical motif, especially since it’s served in the same tiki fishbowl glass as the rum and pineapple concoctions for which the Tiki Lounge is known. It’s kind of like reading Heart of Darkness in a blizzard, in a good way. I’ve mentioned this place a few times in this space, usually because of their booze. But my admiration extends beyond the Lounge’s ability to get me toasted, the oxygen bar, or even the kama’aina deals. You see, they have vegan chilidogs. And, like, nine different types of ketchup. This is one of a few establishments where I’ve actually been able sit at the bar and order food I, given my dietary restrictions, can eat. Nestled in the heart of Kihei’s fabled Bar-muda Triangle, this place is the quintessential island boozer’s haven; a landslide victory for the retro-tropical set. Yet there is more to the place than blowfish lanterns and killer punchbowl Mai-tais. The surprisingly-not-too-sweet lychee-watermelon martini gets my vote, tasty and intoxicating. They also serve great housemade pizza, salads, and sausage sandwiches. The place gets pretty packed on weekends, and there is either live music or a DJ spinning out tunes every night. Bonus: their kama aina deal scores those of us who live here half off on food and drink from 11am to 4pm. Every single day. I should probably disclose right now that I’ve had a major crush on Renie for about four years, but I promise I had nothing to do with the vote count. In fact, I’m pretty sure that hundreds, no thousands of Maui women have had the hots for Renie over the years. Alcohol does that to you. Scratch that, alcohol and a highly intelligent bartender who’s literate, articulate, rides a motorcycle, plays some pretty good poker and can pour a Guinness like a god does that to you. I have heard that there is a Mrs. Renie and I’d like to send out a congratulations on landing the best guy on the island, er, Best Male Bartender. I’ve heard that you totally deserve each other and hope that you’ll live happily ever after. Damn it, where’s my beer?! What can I say, except the man knows how to clean a glass. Many a night I have watched this bartender stand behind the South Shore Tiki Lounge bar, loading and unloading the dishwasher, trying to understand the nuances of his trade. Never have I seen him break a glass! Not one! I have no idea how he does his job, but he does it with élan and a professionalism that is seldom seen on this island. Not exactly a Halloween drink, I know, but at least the coloring is right. I had a run-in with one of these on a recent, ill-advised Sunday morning trip to the bar. The orange that characterizes the tequila sunrise possesses a glowing quality, which I believe to be due in part to grenadine. Or maybe magic. I must say I’m more of a Bloody Mary type when a Saturday night defies my concept of linear time by stretching straight on through to Sunday morning. But if you’re going to go super-sweet, why not add insult to injury with one of these? Actually, the Tiki Lounge really only has one thing on the wall—a massive tiki head with eyes that light up bright red and a small generator that breathes smoke from the gaping mouth. Scary? Not really. Kitschy? Absolutely. But it’s also kind of cool. South Shore Tiki Lounge sends occasional “Wiki Wiki” email updates about stuff worth knowin’ about. We respect your time and privacy so your email will only be used for this purpose. $6 Patron shots 10pm-midnight and $5 Crown Royal until close.